At Town-owned Thompson’s Field, AmeriCorps members built and installed a bench overlooking the open, grassy meadows. This bench is one of two donated by the Harwich Conservation Trust. The walking trails and benches in the Coy’s Brook Woodlands, the A. Janet DeFulvio Wildlife Sanctuary Boardwalk and the fifty tree swallow nestboxes placed around the historic Bank Street Bogs resulted from a special collaboration between the Harwich Conservation Trust and Barnstable County’s AmeriCorps-Cape Cod. These diligent, dependable volunteers help to maintain and enhance HCT’s diverse protected open space holdings as well as properties owned by other non-profit land trusts. 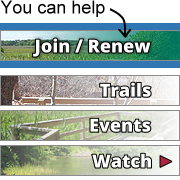 They also lend their time and energy to town-sponsored conservation projects, such as saving the open meadows of Thompson’s Field, which is 57 acres of open space owned by the Town of Harwich. 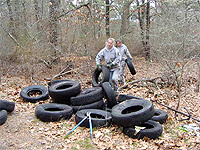 AmeriCorps volunteers lug more than 30 old tires out of the woods off Lothrop Avenue in West Harwich where HCT has preserved several unique natural areas like the Coy’s Brook Woodlands and the Lee Baldwin Nature Walk. 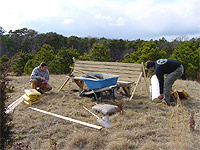 AmeriCorps-Cape Cod is a residential service program that offers people from around the country an opportunity to address issues facing the Cape’s fragile environment. This local program is part of a larger national service network. AmeriCorps volunteers focus on improving and preserving the quality of natural resources through hands-on conservation and education initiatives. The program is funded by Barnstable County, and through grants from the Massachusetts Service Alliance and the Corporation for National Service. For more information, please contact the Barnstable County Resource Development Office at 508-375-6869 or www.americorpscapecod.org.